Do I need to learn soldering? 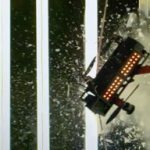 To start this out, I’ll be pretty blunt: if you want to get into DIY quadcopters, you’re going to need to get comfortable with soldering. That being said, it really does not need to be as intimidating as it sounds to most people. In fact, I would posit that learning how to configure Cleanflight, or how to tune your PIDs are tougher than learning how to solder, yet in my experience it is the soldering that puts off the most people from the hobby. The ironic thing is that of all the skills you may learn while building your first miniquad, soldering probably has the most practical effect on your ability to do things outside of the hobby. The soldering skills I picked up when I got into planes and helicopters many years ago have helped me fix countless electronic items that I would have otherwise thrown out. It has paid for itself over and over in that respect. 1. Having the correct tools and supplies. 2. Getting a little bit of practice before you move on to the real thing. Before you can get into either of these though, you really should do a little research on the basics of soldering. I don’t intend to write a tutorial on how to solder. This topic has been covered in a ton of detail throughout the internet, with a lot more detail and production value than I can hope to offer. Instead, I will offer you some links to some videos and websites you can go to to learn the basics. 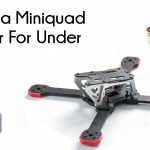 Once you have a grasp of the theory, read through my suggestions on tools and practice, and get to building your miniquad! My favorite place to point soldering beginners to is Adafruits outstanding Soldering guide. This guide will teach you everything you need to know to learn how to solder things onto PCB boards, which is something we do a lot while constructing miniquads. Another tutorial that is more focused on the hobby was written on the FlightClub site. Included on this site is a fantastic video that shows how to solder pretty much every kind of joint you will use on a miniquad. The one thing missing from either of these tutorials is how to solder battery connectors, which normally requires a lot more solder and a hotter temperature. Flight test did a great video showing how this is done using the preferred connector in the miniquad world, XT-60. Similarly, UAV Futures put together another great soldering 101 video that highlights most connections. His putty idea is really interesting as a replacement (or additional) set of helping hands. An fully-featured soldering station with iron. Pick up the Wellder WLC-100 if you are on a budget, or the WESD-51 if you have a little bit more money to sink into it and want a nicer product (I have both and they are both excellent). A spool of good quality solder – Don’t get the small kits of chinese solder. Buy this once and you will literally never have to buy solder again. I solder a lot and have been using mine for several years now. 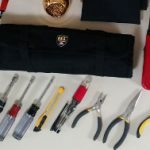 A brass tip cleaner – Cleaning your soldering iron isn’t touched on enough in a lot of tutorials. If your tip isnt shiny silver it needs to be cleaned or it won’t work correctly. These re-useable tip cleaners work a lot better than sponges most of the time. De-soldering wick – You don’t need a lot of this, but you do want to have some on hand for when you need it. Nothing is more frustrating than accidentally putting down too much solder and not being able to lift it. Grab some silicone-jacketed wire and XT-60 connectors. You will need both of these for your miniquad build so you might as well grab some right now to practice soldering. For practicing on the XT-60 connectors, I recommend you do your work on the female connectors – these almost always come with any battery you buy and as a result you’ll never actually use them. 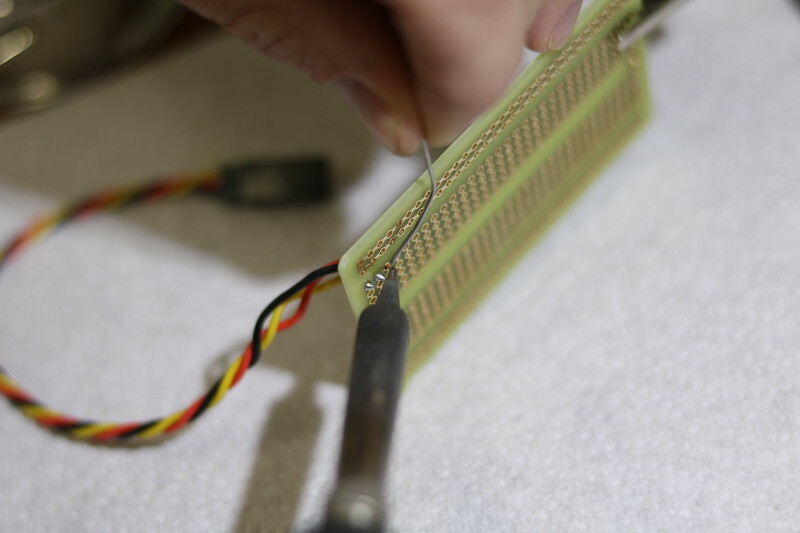 Practice soldering to these connectors by first filling the connector’s “cup” full of solder as is pictured on the right. 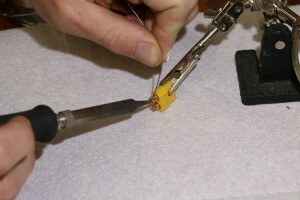 Next, apply solder to the wire, a process called “tinning”. Finally, press the two together and apply heat to join them. 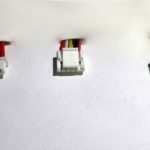 If you apply too much heat, you will notice the connectors start to melt through their plastic casing or fall out entirely. Don’t worry about it – this is why you are practicing and not doing it on the real thing. As you get better, you will apply less heat and the connectors won’t melt anymore. Pick up a prototyping board and a set of servo cables (these will be invaluable in your build – might as well grab them now), and practice soldering one wire at a time through a single hole in the prototyping board. As you do this over and over, you will notice that you will begin needing less heat to get the job done, causing the wire jacket to melt back less and the finished product looking better and better.